A major study that sequenced the genomes of monarch butterflies from around the world identified a gene related to muscle function that appears central to the monarch’s spectacular annual mass migration across North America. 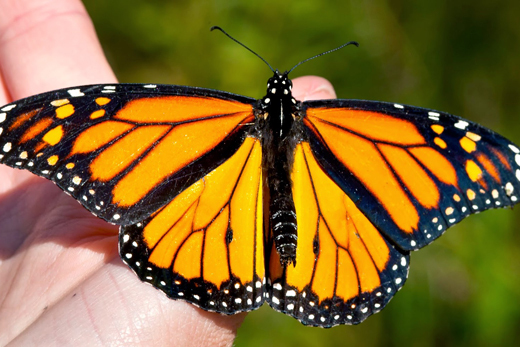 The findings, published in Nature October 1, also traced the evolutionary origins of monarchs to North America, instead of South America as was previously hypothesized, and identified a gene related to the butterfly’s distinctive orange-and-black coloration. "Our findings add several interesting twists to our understanding of these iconic insects," says Jaap de Roode, an evolutionary ecologist at Emory and a co-author of the paper. Evolutionary geneticist Marcus Kronforst from the University of Chicago led the sequencing of the genomes of 101 monarchs, which involved scientists from five other universities, in addition to Emory. De Roode, who runs one of a handful of labs in the world focused on monarch butterflies, assisted in the design of the project and the analysis of the results.